PHNOM PENH, CAMBODIA – Media OutReach – October 15, 2018 – At a simple but dignified ceremony held in the National Sports Complex at the Olympic in Phnom Penh, His Excellency Mr. Yuok Ngoy, the Secretary of State of the Ministry of Education, Youth and Sport of the Government of Kingdom of Cambodia and the Vice Chancellor of the Asian University for Women (AUW) in Bangladesh, Professor Nirmala Rao, OBE, FAcSS, signed a Memorandum of Understanding announcing 50 five-year scholarships valued at US $3.75 million for outstandingly talented women from across Cambodia to pursue their undergraduate studies at AUW. As part of the MOU, the Ministry of Education, Youth and Sport (MoEYS) of Cambodia — led by its Secretary of State H. E. Mr. Yuok Ngoy has committed to undertake a national campaign to identify for AUW the most promising students from all 24 provinces of the country. The MOU signing ceremony was witnessed by AUW Founder Kamal Ahmad, Under Secretaries H. E. Samedy Sivathana, H. E. Ms. Soeur Socheata, and Deputy Director General Dr. Hun Chanrith, other high officials of the MoEYS, AUW alumnae in Cambodia, and representatives of TV and other media. Asian University for Women’s commitment to Cambodia follows its earlier similar commitments to Afghanistan and Yemen. At home in Bangladesh, the University has extended opportunities to daughters of borrowers of the Grameen Bank and other microfinance institutions, women who work at Bangladesh’s largest export industry — the ready-made garment sectors — as well as women drawn from the country’s extensive network of madrasas. It has also made a special commitment to support education of Rohingya women from Myanmar. AUW Vice Chancellor Professor Nirmala Rao expressed her appreciation to the Royal Government of Cambodia for extending such enthusiastic collaboration in meeting a key human development challenge for their country. She noted that AUW was proud of the many students from Cambodia it has already graduated, and looks forward to being a key partner in Cambodia’s endeavors to empower its women through the highest quality education possible. AUW Founder noted that when the Asian University for Women was established in 2008, Cambodia was selected as the only South East Asian country from where students were recruited at AUW at that time. AUW’s decision was in part out of remembrance of the Khmer Rouge atrocities that decimated the educated population of Cambodia. He noted that Bangladesh had suffered a similar fate in 1971, and it is an act of solidarity with Cambodia that AUW is now embarking on scaling up support for Cambodian women’s education. The Asian University for Women Cambodia Scholarship will provide full scholarships for selected female Cambodian nationals from each of Cambodia’s 24 provinces to attend AUW in Chittagong, Bangladesh for Access Academy — a one-year pre-collegiate program — as well as three years of undergraduate study, culminating in a bachelor’s degree in one of the five academic disciplines offered at the University — Economics; Politics, Philosophy, and Economics; Environmental Studies; Public Health; and Bioinformatics. A 2013 Cambodian graduate from AUW, Duth Kimsru, works at a Cambodian-based non-profit organization dedicated to empowering young Cambodians, and was invited to meet former President of the United States Barack Obama in Singapore this March, along with nine other emerging leaders from Southeast Asia. Another notable AUW graduate is Vylyny Chat (2014), who was recently featured in Voice of America, and is a PhD candidate in epidemiology at New York University Medical School. Two other AUW graduates — Sreymom Pol (2013) and Sreymom Oy (2014) — are currently pursuing graduate degrees at Oxford and UCLA, respectively. 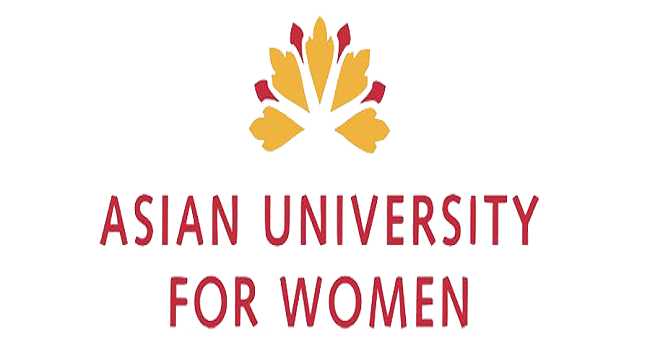 Founded in 2008 and located in Chittagong, Bangladesh, Asian University for Women is the first of its kind: a regional institution dedicated to women’s education and leadership development — international in outlook but rooted in the contexts and aspirations of the people of Asia. Chartered by the Parliament of Bangladesh, AUW exists solely to support a rising network of women leaders, entrepreneurs, and change makers from across the region. It seeks out women who have significant academic potential and demonstrate courage and a sense of outrage at injustice and are empathic to the woes of other people.